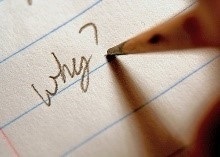 Does Your Adviser Know Your Why? How objective is the adviser? Would they hold your best interests first? Will their top priority be to help you or to make a sale? Would you feel comfortable recommending them your friends and family? And, probably most importantly, DO THEY KNOW YOUR WHY? The financial services industry sometimes gets a bad rap because of advisers who operate purely with selfish motives, not putting the client’s best interests and priorities above their own agenda. This is an industry-wide issue that directly affects clients and how they reach their goals. Let me explain. Advisers can have preconceived notions before entering the meeting as to a product or service that they will recommend no matter the issue or goal the client may have. However, in fact it is our duty — especially those of us who are fiduciaries — to always act in the best interests of the client and put their needs first and foremost. A trusted adviser learns as much as he/she can not only about what you want, but WHY you want it. Why is what drives us to reach goals, not what. Building an authentic client-adviser relationship will help immensely when the adviser makes recommendations based on the client’s needs and wants, as well as the clients making the actual decision to move forward with that adviser. No one wants to be sold, but they do want to be educated and empowered to acquire what they need. Everyone’s needs are unique, so do your homework and listen when you meet with an adviser. Make sure this adviser always puts your interests first, listen to what the advisor asks, and ask questions that are important for you to decide if they will be the person who is going to help you to the finish line. Article by Erick G. Colon.